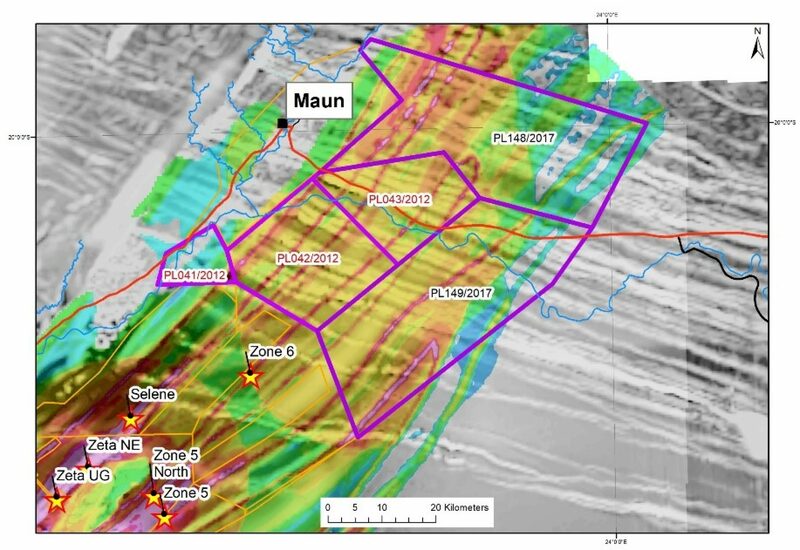 Cu-Ag mineralisation in the Kalahari Copper Belt is typically located in reduced shales and siltstones of the D’Kar Formation in proximity to the contact with underlying oxidised red-beds of the Ngwako Pan Formation. Although mineralisation is stratabound, sharing commonalities with the Central African Copperbelt and Kupferschiefer Cu district, later deformation has served to remobilise and locally upgrade deposits. On a district-scale, targeting focusses on areas in proximity to basement highs and Kwebe-volcanics in-line with a typical stratiform Cu-model. Locally, structure and trapsites play an important role in controlling mineralisation. 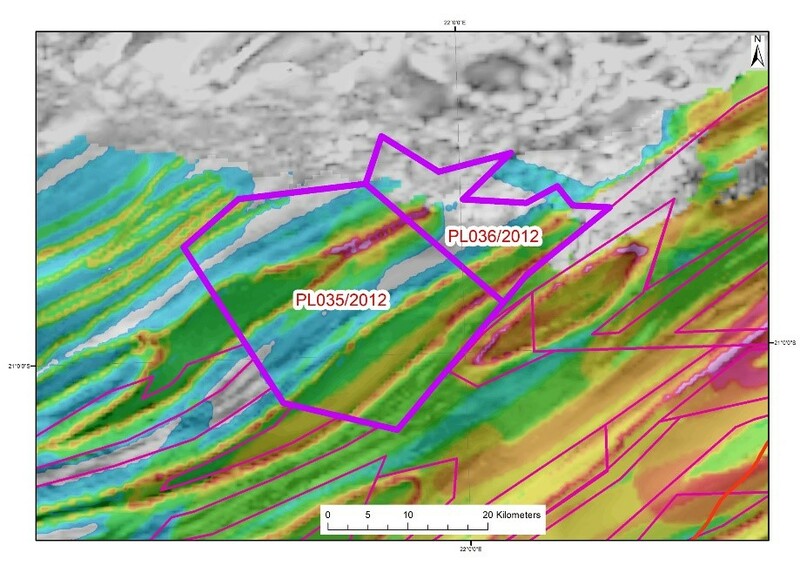 By reprocessing and inverting regional geophysical data combined with an extensive GIS database of the KCB geology, KML have mapped out several key vectors to mineralisation. 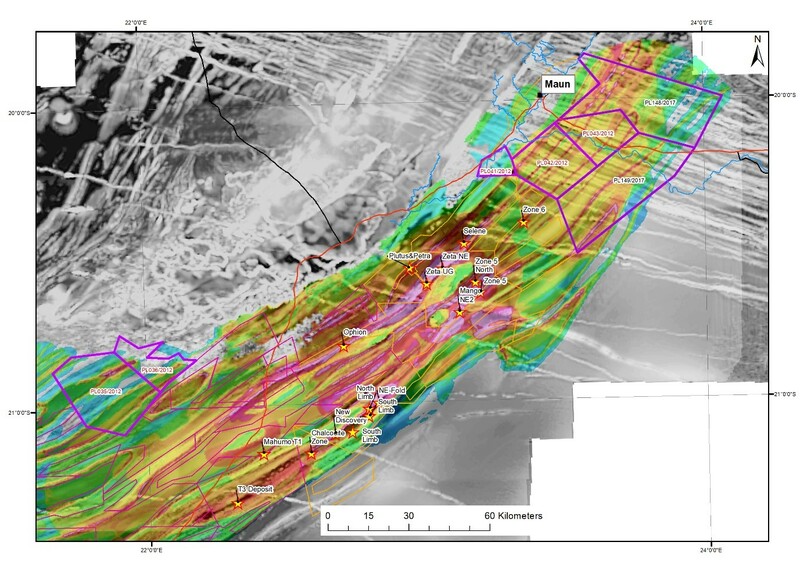 These layers have then been combined using a Mineral Systems approach to highlight prospective areas for mineralisation. Mineral Systems approach to target generation. 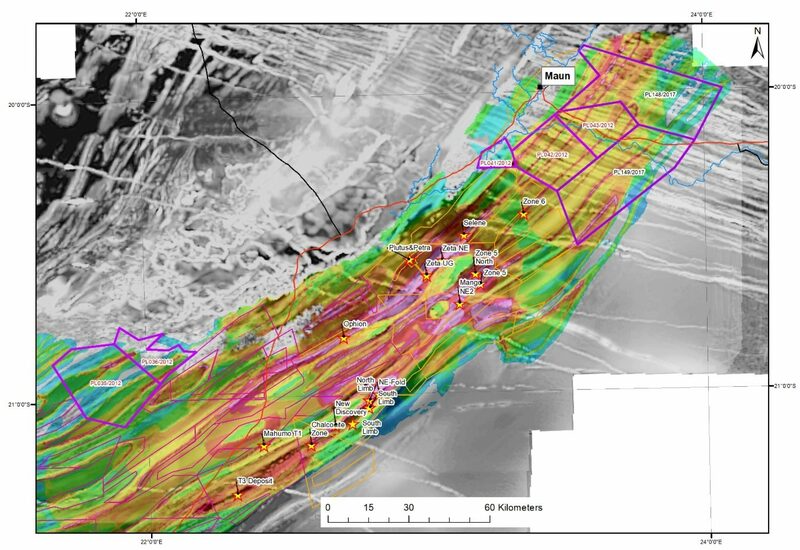 Key vectors to mineralisation derived from 3D geophysical inversions, 3D vector dip and strike modelling, structural and geological interpretation. Source: Regional gravity inversion highlights basement highs; Kwebe volcanics modelled and interpreted from government magnetic data. Pathway: Structures and dykes interpreted from government magnetic data. 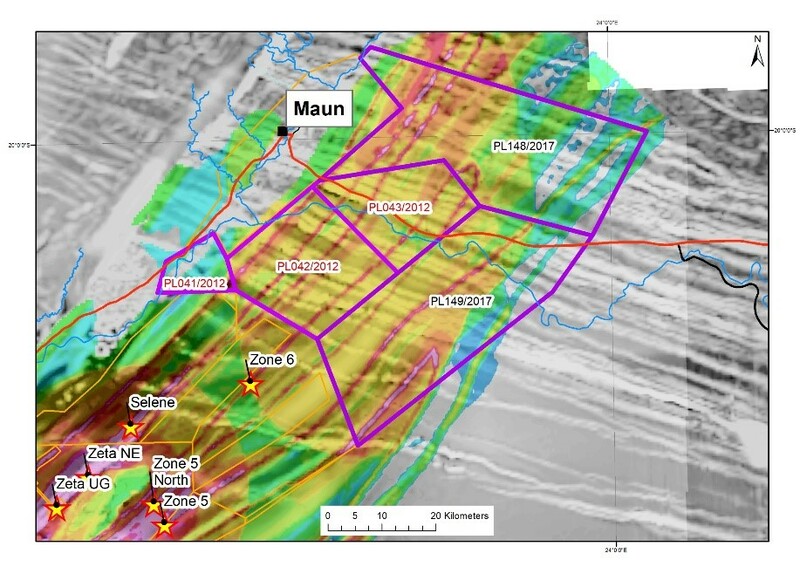 Trapsite: Geology interpreted from government magnetic data, including contact between non-magnetic D’Kar and magnetic Ngwako sedimentary units; dip and strike modelled in 3D from automated Naudi models; anticlines and moderately dipping contacts prioritised. Prospectivity image on magnetic depth slice. 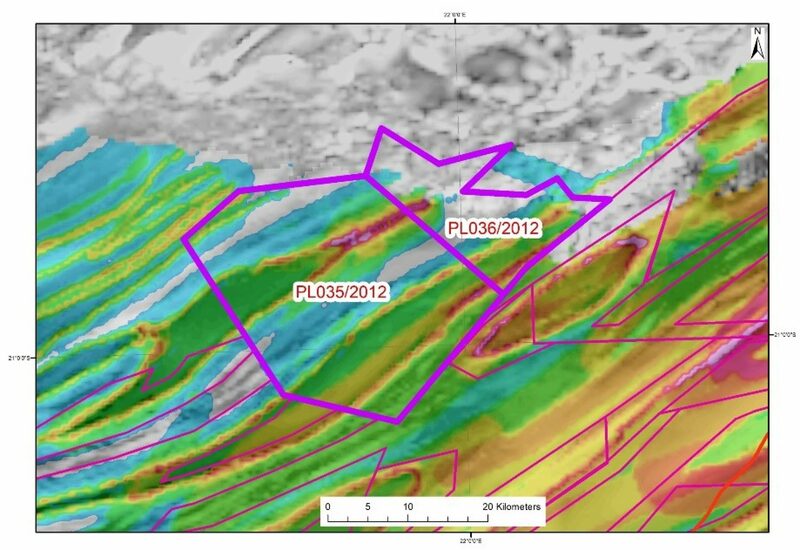 KML exploration ground and known deposits highlighted.